Orly Ruaimi is an interdisciplinary artist working with a variety of materials that serve as a means to an end to her conceptual approaches in art making. Orly recently graduated with her MFA from the San Francisco Art Institute and has already completed two artist-in-residencies before coming to Las Cruces. The graduate students have been able to see her process from beginning to end as well as talk to her about their own work. While Orly has been here, she has taken advantage of the different areas in photography, ceramic kilns and the sculpture area. Our safety technician and also sculptor, Adam Labe, worked with Orly to develop a vacuum forming technique that was then demonstrated to our students, recently in a workshop, so they could see the possibilities and how she uses it in her own work. 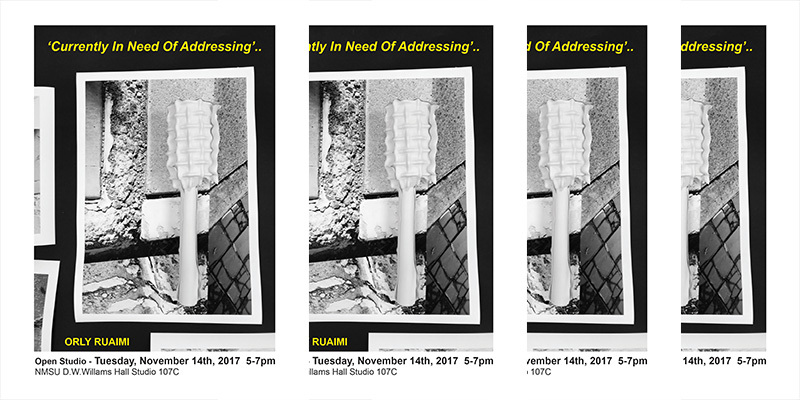 Please join us in the Williams Annex (south entrance), from 5 – 7 pm to see the culmination of artist, Orly Ruaimi’s artwork produced in the last month. Having an artist here who works across many different disciplines, offers an opportunity for our graduate and undergraduate students to see her process and it also embraces our department’s own philosophy towards embracing an inter-disciplinary approach as seen through the curriculum and in the student’s work. This entry was posted in Artist-in-Resident, Exhibit, Visiting Artist and tagged #artistinresidence, #contemporaryart, #inter-discliplinary, #nmsuart, #orlyruaimi. Bookmark the permalink. Follow any comments here with the RSS feed for this post. Both comments and trackbacks are currently closed. « Art in Public Places for the HJULC Building Made Their Final Selection!